I often struggle to name my favourite author. I've read so many books by so many different people that I can't quite put my finger on my absolute favourite. Differing genres and messages make it all the more difficult. 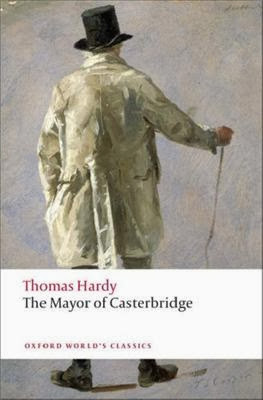 However, of all the classic novelists, Hardy is my absolutely favourite, and The Mayor of Casterbridge the most wonderful classic novel of all. With Jude coming in a close second. The novel is so perfectly constructed I could spend all night praising it. It has everything required for a circus of drama - love triangles, people coming back from the dead, bad timing, lies, eavesdropping, deceit, public shaming - but is far more than all that. This is the story of Michael Henchard's long self-punishment for the shameful sale of his wife and daughter twenty years prior. Hardy really makes you live through this with Henchard; you taste his discomfort, feel his sorrow, and although he disgusts you, you live in hope for him as he tries to redeem himself. Unfortunately, Hardy novels aren't well-known for their fair and forgiving treatment of main characters, but hope is a nice thing to have. Henchard's subsequent downfall is absolutely mesmerising. We see how the past coming back to haunt a person can really destroy them, how regrets and shame can really shape a person, and also how missed opportunities, no matter how minor, can really make a difference. The worst part, for me, was Henchard knowing he couldn't change the past, but being totally oblivious of how to move on as a better person. That's a terrifying state of mind to be in; Hardy's depiction of Henchard's mind slowly ebbing away is priceless and horrifying. He's his own worst critic, and aren't we all? Hardy's grasp of human nature is amazing, and can even be related to in our time. I enjoyed Hardy's exploration of how events affect people differently, along with his social commentary on the people involved. As always, Hardy's women are concerned with their social reputations, and the men are constantly battling for the alpha-male title. Most of all, seeing how the characters interacted, never knowing how they were going to react to a situation, was brilliant. Sparks flew. Wonderful. I'd encourage anyone to consider reading this novel, and please let go of your preconceptions of classic literature. This has more drama than a modern soap opera, and more peeling back of the human psyche than Facebook.